Beta MOD is only compatible with starcraft v1.16.1. GPTP Plugin Source Code include : Wraith Burst Laser Upgrade, immersive air unit movement (a.k.a U turn motion), Spider Mine Throwing and more. I have run this mod and it's awesome. 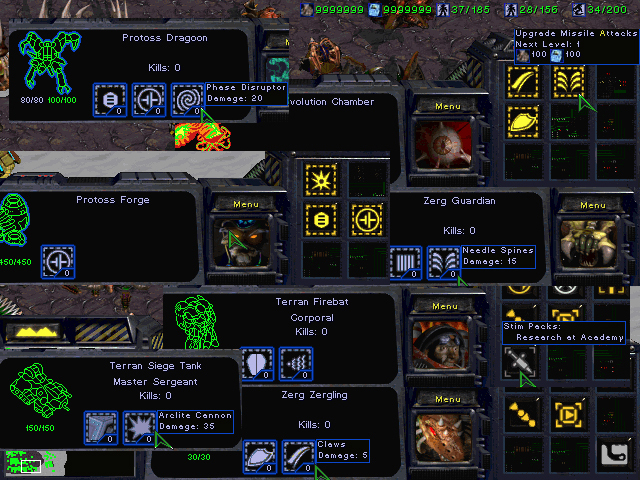 The adaptation of SC2 into SC1 is smooth, all the animation of both units and building, the icons, symbols work nicely. Why don't you guys make a mod to play the REAL SC2 game in SC1, I mean just for SC1 players to try the game SC2 only. Burning Ground is fun, but it is somewhat too fast, OP, and probably not for the taste of all players. I really want to play SC2, but since I couldn't afford to purchase it, and it seems like noone does the mod better than you guys, I am asking for that favor. If any of these offends you, please forgive. I do not have any intention to do so. Still a great job you have done! Will the mods work with the new version? it is clear that there is no plan. Mod tool is outdated, no compatible sc v1.18. what is aqueous rift ? but, we can't recreate them all. This will require very hard work, think about water wave graphics. You aren't explaining everything of the recreated behaviors, some things aren't clear with gifs and no explanation. Also please tell us the differences, helps estimating what you will be changing. A mod I made for StarCraft about 2 years ago, hoping to revive it soon.